As I write this, the 31st Space Symposium (SS) will kickoff in just 5 days, on April 13 at the incomparable Broadmoor Resort in Colorado Springs, Colo., at the foothills of the beautiful Rocky Mountains. If you haven’t figured it out already, the 31st SS is not a WWII German unit designation, but the 31st Space Symposium, which Dr. Neil deGrasse Tyson, famed astrophysicist, bestselling author, director of the Hayden Planetarium and host of the hugely successful television series Cosmos: A Spacetime Odyssey, simply calls “the most awesome symposium in the world.” Very high praise indeed, and a sentiment with which I totally agree. This year’s Space Symposium, which is sponsored by the Space Foundation, will be the largest ever held in terms of venue, size (number of exhibitors and speakers) and attendance. Approximately 10,000 space enthusiasts are expected to attend, and I hope you are one of them. My sources tell me the classified sessions (Cyber 1.5 and classified space sessions) are filled to overflowing — no new registrations allowed there. The exhibitor space at the Ball Aerospace Exhibit Center and Pavilion is bursting at the seams. The organizers are turning exhibitors away, so better luck next year. But if you just want to attend the greatest space symposium in the world, bar none, there is still time to register. By the way, if you haven’t figured it out already, this is a truly international event. My sources at the Space Foundation stated that the 31st Space Symposium will have more international participation than ever, including more than 150 exhibits of the world’s latest space technology, products and services. The Ball Aerospace Exhibit Center will host more than 30 first-time exhibitors with more than a dozen countries represented, including: Austria, Canada, Denmark, France, Germany, Japan, New Zealand, Norway, Scotland, Sweden, Turkey, the UK and the U.S. The symposium is expected to attract space leaders from more than 25 countries, representing all sectors of the global space community. Everyone who is anyone in the space world will probably be there or be represented. Consequently, the networking capabilities are unparalleled. Not to mention just being able to avail yourself of the world-famous Broadmoor Resort hospitality, plus the crisp, clean and cool mountain air at 6,000 feet. For many years, the event was known as the National Space Symposium. It outgrew that moniker many years ago, and is now simply known as the Space Symposium. Every year before I attend the Space Symposium, I make a “ToDoToDay” list of topics I want to explore, both as a journalist and in my senior space analyst profession. Plus, of course, I make a list of people I definitely want to talk with or interview. This year, I thought I would share some of those to-dos with you, because you may indeed have some of the same interests. Wearing my subject matter expert (SME) hat, so to speak, I recently had the honor of touring the Lockheed Martin (LMCO) Space Systems facility in Waterton Canyon (far West Denver), Colorado, where the GPS III satellites are built, integrated and otherwise readied for launch. I took the opportunity to chat with Mark Stewart and his crew. Mark is vice president for manufacturing and space systems and program manager for GPS III. I learned that the first GPS III space vehicles (SVs) is much farther along than most everyone thinks. The problematic MDU (Mission Data Unit — the heart of the system) from Exelis has been fully tested and integrated into the payload. GPS III SV1 was only three days from being totally integrated or mated, as they say, with the on-orbit propulsion portion of the payload (the remainder of the LMCO A2100 bus) and beginning its months-long testing, certification and verification process. According to Mark, GPS III SV-01 — which powered on initially in February 2013 — now is in integration and test flow leading up to final delivery to the Air Force. While it was thrilling to see everything finally coming together, I will also tell you candidly that the next milestone everyone is asking about, the first GPS III launch date, is probably as fluid as the Snake River in Spring. So, while I do not feel comfortable quoting a first launch date, and LMCO would not give me a firm date for delivery of the first GPS III SV, I do feel comfortable making this prediction: Barring any unforeseen major issues during testing, LMCO will be ready to deliver to the U.S. government the first ready-to-launch GPS III satellite by the end of this calendar year. That’s right, in my humble opinion the first GPS III SV will be ready to deliver to the Air Force by December 2015. When it will actually be launched is anybody’s guess; obviously, the sooner the better. Apropos of the Boeing IIF initial launches and critical on-orbit anomalies, the sooner the LMCO GPS III is put into orbit for full-scale operational and mission analysis tests the better. The critical question of course is: Will the U.S. Air Force (USAF) have a ground control system that can successfully and reliably launch and support a full-up GPS III SV by the end of 2015? Certainly not if they stay the course with OCX, but there are alternatives, and you know who you are! Can you say LADO, Launch/Early Orbit, Anomaly Resolution, Disposal and Operations System? 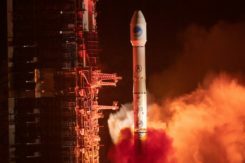 Consider that LADO has been utilized to launch GPS satellites as far back as the GPS IIR-M family of satellites, also produced by LMCO, one of which was successfully launched on October 17, 2007, using the then-new LADO system. That milestone ensured the GPS program continued to provide superior space-based navigation for billions of users, military, civilian and commercial, around the globe using industry-leading highly modified (Aces Premier) commercial launch technology. This significant achievement was the culmination of outstanding teamwork between the USAF, Braxton Technologies, the engineering firm and the prime contractor. The LADO system formed and is still the backbone of the new GPS Command and Control (C2) functionality implemented by the prime contractor. It known today as the Advanced Architecture Evolution Plan (AEP). Subsequently, LADO is now the primary launch system for all current and future (IIR-M, IIF and possibly GPS III) satellites, which should allow the U.S. Air Force to retire some outdated legacy GPS ground support and command and control systems. The first successful 2007 LADO launch and control of an operational GPS IIR-M satellite, and the 1SOPS and 2SOPS operators’ acceptance of the GPS LADO system, was proof that commercial software can be deployed effectively even in a militarily critical mission system, saving the government both cost and schedule without sacrificing mission-unique capabilities. In my humble opinion, that is where we need to go today. Let’s return to the tried-and-true LADO and prime contractor partnership and launch the first GPS III SV by the end of this year, or certainly by early 2016. Please notice I have not made any statements concerning scrapping the hugely expensive, 100-percent-over-budget-and-schedule (years behind) OCX program of record. Under Secretary of Defense for Acquisition, Technology and Logistics (USDATL) Frank Kendall recently announced the controversial decision that OCX as the program of record would go forward under strict scrutiny with definite milestones that must be met. Scrutiny is a fickle mistress, and historically on the OCX program, milestones are there to be missed. Meanwhile, the USAF requires a tried, proven and utterly reliable capability to launch GPS III SVs as soon as the first few become available. The USAF must place several GPS IIIs on orbit for a full checkout to ensure there are no major anomalies. Currently, LADO had an eight-year proven track record with no failures, and it remains the only program that can initiate, control and dispose of residual GPS satellites — including the IIAs, which are the longest lived GPS satellites on orbit today. Beware, there will be many naysayers in government circles, and you may meet some of them at the symposium, that will tell you it is just not possible. But just stop by and talk candidly with LMCO Space Systems and Braxton Technologies personnel, and see what they have to say. You may be surprised by what you hear. Then stop by the Raytheon booth and check on the status of OCX. Speaking of OCX and Raytheon, Lynn Dugle retired from Raytheon on March 2, 2015. Historically, Lynn has been a very capable executive. She is the former president of Raytheon’s Intelligence, Information and Services (IIS) business, which handles several key U.S. Air Force space contracts, including OCX, the current program of record for the next-generation ground system for GPS III. Dugle served as president of the division beginning in 2009. David Wajsgras (your guess is as good as mine), Raytheon’s former senior vice president (SVP) and chief financial officer (CFO), has replaced Dugle. Wajsgras served as SVP and CFO of Raytheon Company from March 2006 to March 2015. As a member of Raytheon’s senior leadership team, he directed Raytheon’s overall financial strategy. In my humble opinion, he has his work cut out for him. He will need all of his financial expertise and acumen to make OCX a success — financially and, hopefully, operationally. The program is grossly over budget, several years behind schedule, and reportedly, my sources tell me, far less capable than originally planned. Good luck, David. As long as we are still speaking primarily of female executives with great track records, USAF Lieutenant General Ellen Pawlikowski, who I have had the honor of knowing and working with for the past 25 years, was recently nominated for her fourth star. General Pawlikowski successfully commanded the SMC (Space and Missile Systems Center) and served as Program Executive Officer (PEO) for Space for three years at Los Angeles Air Force Base in California. Among her many successful space acquisition programs, she was responsible for GPS procurement during her tenure. Currently, General Pawlikowski serves on the East Coast in the Pentagon as the military deputy to William LaPlante, Ph.D., the assistant secretary of the Air Force for acquisition. In other words, LaPlante is the Air Force’s Service Acquisition Executive, responsible for all Air Force research, development and acquisition activities. Previously, just to add to her mystique, General Pawlikowski spent more than one tour at the super secret National Reconnaissance Office. When confirmed, General Pawlikowski will be only the third female four-star general in U.S. Air Force history. A well-deserved honor and one that certainly merits acknowledgement. General Pawlikowski is scheduled to speak several times at the Space Symposium, so when you see her, congratulate her on a job well done and on being nominated for her fourth star, and wish her luck in her new assignment as the head (four-star commander) of Air Force Materiel Command. Before we leave the female leader category, my sources tell me that USAF Colonel DeAnna Burt, commander of the 2nd Space Operations Squadron (2 SOPS, the GPS squadron) from 2008 to 2010, will in June 2015 become only the third female commander of the 50th Space Wing at Schriever AFB, Colorado — home to 2 SOPS. She follows in the very capable footsteps of then-Colonel Suzanne (Zan) Vautrinot, who was the first female wing commander at the50th Space Wing followed by then-Colonel Teresa (Terry) Djuric. Note that both Suzanne and Terry, who are now retired from active duty, went on to become general officers in the USAF. Currently, Colonel Burt serves as director of the Air Force Space Command (AFSPC) Commander’s Action Group for General John Hyten. General Hyten, the current commander of AFSPC, is himself a former 50th Space Wing commander, and he will also be speaking several times at the space symposium. Here’s a big hint: As a four-star general, General Hyten has morphed into quite a forceful, informative, entertaining and engaging speaker. You won’t want to miss any of his presentations. If you see Colonel Burt at the Space Symposium, please congratulate her on her new assignment, and you might offer her your prayers for the incredible amount of responsibility she is about to assume. I’m betting she can handle it. Another USAF general officer you are sure to run into at the Space Symposium is a newly minted brigadier general known by some as Wild Bill Cooley. General Cooley, who is currently the director of the GPS Directorate at SMC, was pinned on just a few weeks ago and will be speaking several times at the symposium. Wild Bill also deserves your congratulations. By all accounts, he is doing a great job and has more stars in his future. So, while there are several points to be made, a key one appears to be that if you are heavily involved with the GPS program inside and outside the USAF and you do a good job, it can work wonders for your career. If you want to hear from those who have been successful, the 31st Space Symposium is the place to be. I hope to see you at the Broadmoor April 13-16. Come early and wear your walking shoes. Please stop by the GPS World booth and say hello to everyone. I will be there for sure. As I wind up this to-do list, I will tell you about another Space Symposium event where it is important, even critical, to be seen. Everyone who is anyone will be attending the Connecting Colorado private function on Wednesday evening, April 15. The event is hosted by the Braxton Science and Technology Group; this is the third year for the coveted event. As I have stated before, I have attended 26 of the 31 Space Symposiums, and I have never been to an after-hours function during that time that even approaches the quality and class that Connecting Colorado exudes. It is a first-class event in a visually stunning venue, where private access passes are required to enter and guards are serious about keeping out gatecrashers. If history is any guide, it promises to be an amazing evening of fine wines, sumptuous food, quality cigars, roaring fireplaces and professional camaraderie that can’t be beat. Plus, the networking opportunities are endless. In other words, the Connecting Colorado event is what all the other after-hours Space Symposium events long to be or wish they could emulate. I can’t wait. I hope to see you there, and at the 31st Space Symposium. By the way, April in the Rocky Mountains means dress appropriately — warmly works for me. Until next time, Happy Navigating, and remember: GPS is brought to you courtesy of the United States Air Force.